Helen “Sami” Eleanor Lochridge passed away on October 20, 2018 of natural causes. Blessed with 102 wonderful years, she was born in Burns, Oregon, where her family homesteaded. When her father passed away, during WWI, her family moved to Seattle. At 21, she married her husband, Frank Lochridge. Together they enjoyed commercial fishing in Alaska and built three boats. The third was sold to the United Nations following WWII. In the winter months Helen and Frank sought the warm climate in Southern California and especially enjoyed Palm Springs. There she earned the nick name “Sami” after she sank three holes-in-one! Helen has lived in Gig Harbor for over 65 years. Her waterfront home at the mouth of the harbor has allowed her watch the fishing boats and kayaks each day. Helen was preceded in death by her husband, Frank Lochridge; her sister, Pearl Miller; her brother, Edward Hansen; and her nephew, David Miller. Helen is survived by her nephew, Peter Miller; her nieces, Karen Thurston and Kristine Sullivan; her great nephews, Tim Nelson, Chris Nelson, and Peter Sullivan; her great nieces, Laurie Carey and Melissa Linney; and their families including their children: Shane, Zachery, Oliver, Brooke, Joe, Fletcher and June. She is also remembered by several members of the extended Lochridge family. Over the years, family and friends have been inspired by Helen’s friendliness and openness to new experiences. At each stage of life, she has maintained an interest in the lives of family members, friends and most recently, care givers. A graveside service for Helen will be held on Saturday, October 27th at 10:00 AM at the Enumclaw Cemetery, 23717 SE 416th St. Enumclaw, WA 98022. Arrangements have been made through Weeks’ Enumclaw Funeral Home. Please sign her online guestbook at www.weeksfuneralhomes.com. 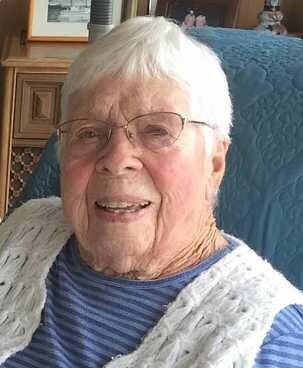 Helen loved living in Gig Harbor and appreciated the historic community. In her honor a bench will be installed at the Harbor History Museum. In lieu of flowers, those wishing to contribute to the memorial bench may send a check to Harbor History Museum, PO Box 744 Gig Harbor, Washington 98335. You may also donate online at www.harborhistorymuseum.org Kindly designate the Helen Lochridge Memorial Fund.